Often, symptoms will be present and gradually worsen over time, according to our nonsurgical back doctor who serves patients in Norfolk, Chesapeake, Virginia Beach, Portsmouth, Suffolk, and Hampton Roads. Symptoms are more likely to be present or get worse when you stand or walk upright. They will often lessen or disappear when you sit down or lean forward. Most people with spinal stenosis cannot walk for a long period of time. The diagnosis begins at our nonsurgical pain relief center with a thorough medical history and physical examination, as well as diagnostic testing including, x-rays, MRI and / or CT Scans to identify the source of pain. 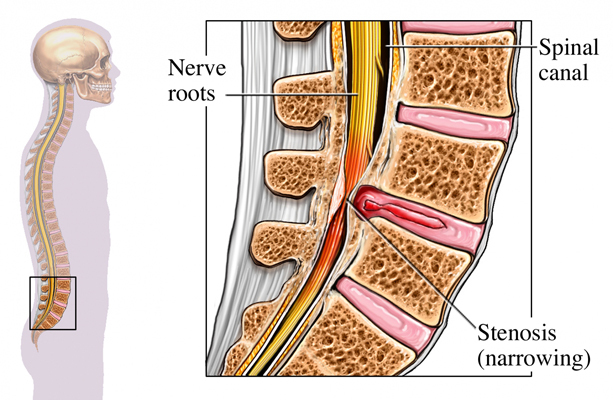 Spinal stenosis responds well to treatment by our nonsurgical back doctor. Pain can be relieved with medications, and a customized physical therapy program. To provide long-lasting relief, epidural steroid injections (ESI) performed under fluoroscopy can be performed. Learning to take care of your back and prevent recurrent episodes of back pain can help you to avoid surgery. If the pain is persistent and does not respond to nonsurgical measures, surgery is considered to relieve the pressure on the nerves or spinal cord. Surgery is performed on the neck or lower back, depending on the site of the nerve compression. Make an appointment to meet with Dr. Bragg to discuss treatment options for spinal stenosis.